Is Bitcoin Cash and Bitcoin the Same Thing? Bitcoin is a virtual currency (or cryptocurrency) that allows its users to send and receive funds directly to one another without requiring a bank or other payment-processing intermediary to facilitate the transaction. This peer-to-peer system is based on blockchain technology, which maintains a public ledger of all transfers on the bitcoin network while preventing fraudulent activity such as double-spending. Bitcoin is the world's most popular cryptocurrency by a wide margin, but it has faced significant challenges as it continues to expand, especially when it comes to scalability and handling its rapid growth. 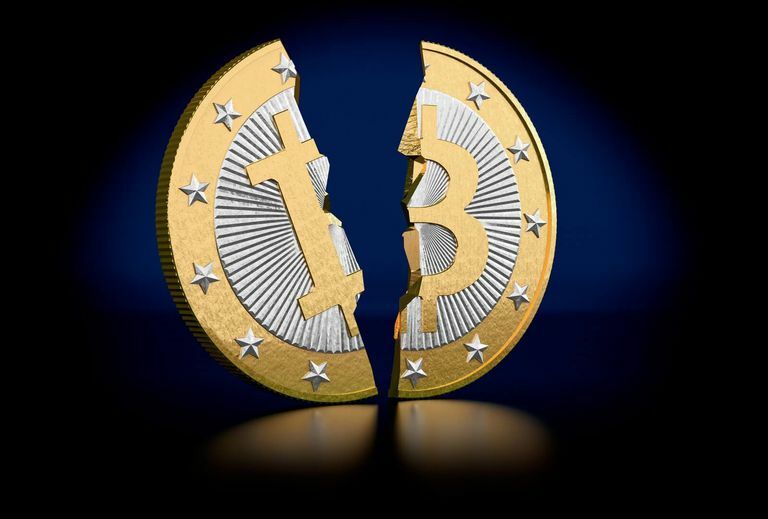 Disagreements within the bitcoin community about how to address these issues eventually led to a hard fork in its blockchain and the creation of a new standalone cryptocurrency named Bitcoin Cash. Bitcoin uses the Proof-of-Work (PoW) method to confirm transactions on its network and subsequently add them to the blockchain. When a transaction first takes place, it is grouped with others that have yet to be confirmed in a cryptographically protected block. Computers referred to as miners then use the processing power of their GPU or CPU cycles to solve complex mathematical problems. They pass the data in a block through the SHA-256 algorithm until their collective power discovers a solution and solves the block. Once solved, the block is appended to the blockchain and all its corresponding transactions are validated and considered to be fully processed at that point. The miners that solved the block are rewarded in bitcoin, with the amount each individual receives varying based on their respective hashing power. The maximum size of a block in the bitcoin blockchain is capped at 1 MB, limiting the number of transactions that can be confirmed at any given time. As a result, people who submitted transactions found themselves waiting longer and longer for confirmation as bitcoin usage continued to spike. Those who opted to pay larger transaction fees garnered priority, but the overall bottleneck was evident. The average time for validating the legitimacy of a bitcoin transaction slowed down significantly, a trend that would most likely continue. The solution to this problem may seem simple at first glance — increase the block size. It isn't that simple, though, as there are multiple high-impact pros and cons to factor in when making such a change. Many members of the bitcoin community argued to leave things as is, while others clamored for a larger maximum block. In the end, the hard work of the blockchain was the path decided upon by those in the latter group. The split took place August 1, 2017, marking the creation of Bitcoin Cash as an independent cryptocurrency. Folks who held bitcoin at the time of the fork also owned a similar amount of Bitcoin Cash. All transactions that occurred after block #478558 on the bitcoin and Bitcoin Cash blockchains, however, are part of completely separate entities and have no relation to one another going forward. Bitcoin Cash is an alternative cryptocurrency, also known as an altcoin, featuring a unique code base, developer community and set of rules. Bitcoin Cash's maximum block size is 8 MB, as opposed to bitcoin's 1 MB limit, which theoretically results in lower transaction fees and faster confirmations. Bitcoin Cash transactions use an updated signature hashing (SigHash) algorithm, deeming them invalid on the original bitcoin blockchain and preventing replay attacks. As opposed to bitcoin's main development team, Bitcoin Cash is maintained by multiple independent groups of programmers to decentralize software implementations. Emergency Difficulty Adjustment (EDA) is designed to encourage miners to migrate to the Bitcoin Cash network and provide protection against sudden fluctuations in hash rate. Bitcoin Cash can be bought, sold, and traded for fiat currency such as U.S. dollars or other cryptocurrencies, including bitcoin itself, at many popular exchanges such as Coinbase, Bittrex, Kraken, and CEX.IO. As with Bitcoin, Litecoin, Feathercoin, and other cryptocurrencies, Bitcoin Cash can be stored in digital wallet software or a physical hardware wallet — both protected by private keys. You can also choose to store your Bitcoin Cash offline in a paper wallet, but this method is only recommended for advanced users. For a list of recommended Bitcoin Cash wallets, visit BitcoinCash.org.